Paddling season has officially kicked off in Prince George with the start of our club pool sessions. For all the information about how to get involved, check out this LINK . Keep in mind that pool play is just practice for the real thing --- whitewater rivers! But you can take it as far as you like as really it's just about having fun. Eddy- a river feature formed by an obstacle in the downstream flow. A well formed eddy will have a defined eddy line and a calm pool behind the obstacle. They can be located on the side of rivers or in the middle or rivers. 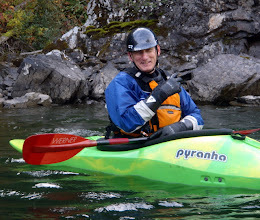 Being able to "catch" or stop in these calm pools is one of the keystones of whitewater paddling. You can use an eddy to slow you down and rest, wait for your friends, look around and scout what is coming next, navigate hazards, and/or to access different river features like surf waves. Eddies are also where you get in and out of a river. Ferry-the act of crossing a section of river without going downstream, or with going downstream as little as possible. While usually thought of as crossing the entire river, a ferry may simply involve moving out into the current a certain distance before allowing the boat to move downstream. Useful for navigating sections of the river and going from point A to B safely. (NOTE: the gradings listed here are based on medium river levels. Most rivers are more difficult in higher water and easier in low water. Some of the narrow canyon-type rivers like the Lower Willow are strongly effected by water level. In the low water of August it's usually a grade I-II run but in the flood waters of May it can be grade IV+. Having a good idea what the river level is before putting on is essential and experience plays a big part here. For a detailed assessment of river grades check this link: grade). Most of the veteran boaters in the club probably took one or two full seasons to get through the above list. It should be made clear that throughout these steps you would have experienced paddlers guiding and assisting you. Sometimes it's worthwhile to head back to the pool, lake or easy river to work specifically on certain skills like the roll. I know for the first couple years kayaking I had to constantly go back to the lake or pool to work on my roll. It's takes a while to get it down solidly --- and it is the single MOST critical skill to learn. Confidence on the water has everything to do with how good your roll is. If you know you can roll it makes a huge difference for trying something on a river cuz no worries if you flip --- you're going to roll back up! And once you're on a real river trying stuff you will flip --- all the time. So beginners and novices should be practicing their roll constantly. Once you learn it in the pool, KEEP PRACTICING!! Don't stop. I can't stress the importance of this enough. Like do 10 in a row and flip over every which way. Then do 10 more. And again. Seriously. On a river it is often the difference between having fun and not. 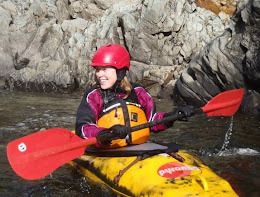 Whitewater kayaking is without question one of the most ridiculously fun sports there are, and the reward is simple --- the biggest grin on your face ever!! Either from the sense of accomplishment from making a move on a river, running a rapid, or just enjoying the amazing setting of the river wilderness with some great people. For a lot of us what makes this sport so great is being a member of a larger paddling community. This is because unlike many other sports, kayaking is unique in how we rely on each other to get down the river. 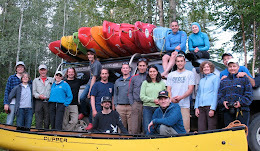 It makes us a pretty tight knit group, even when you travel to other communities to paddle and meet other boaters. Good times and great friendships. This spring is looking very promising! And with the melt getting under way we'll be out on the water soon. Can't wait!! Until then see you next Wednesday evening at the pool. 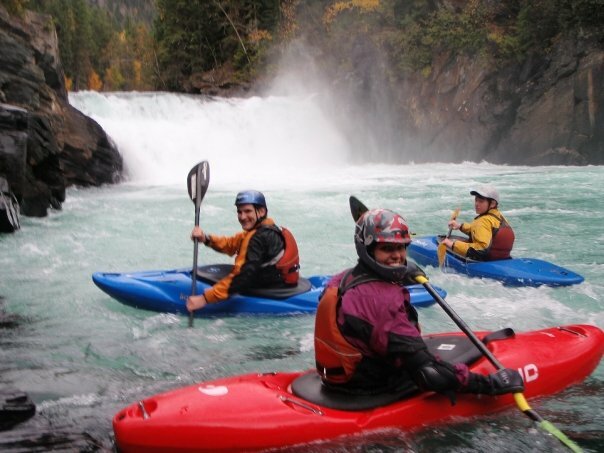 If you need more information on kayaking in Prince George, buying gear, upcoming river trips, or anything related to paddling, check out the forum on the right hand menu. You can also find us on Facebook --- please join our club page!! (search under Facebook for Northwest Brigade Paddling Club).